The Stockport Business Awards, organised by Clarke Nicklin Chartered Accountants, raised over £4000 at this year’s event for charity partner, ‘Signpost’ Stockport for Carers’, with the help of businesses in and around the Stockport region. Andrew Baggott, Managing Partner of Clarke Nicklin, commented “We are delighted to support another remarkable Stockport charity, who I know will benefit greatly not only from the funds raised, but also by relationships made on the night. Businesses in and around the region showed their generosity once again by donating an selection of raffle prizes such as iPads, restaurant vouchers, Hampers and more”. Signpost Stockport for Carers supports anyone over the age of six years old, who is providing unpaid care for a friend, relative, partner or neighbour. This may be a parent with dementia, an adult with down’s syndrome, a partner with motor neurone disease or a sibling with autism. One in six Stockport residents care, unpaid, for a loved one that could not manage without their support. That’s more than 32,000 people – colleagues, neighbours, friends and relatives – juggling a very physically demanding and emotional role alongside all of their other commitments. 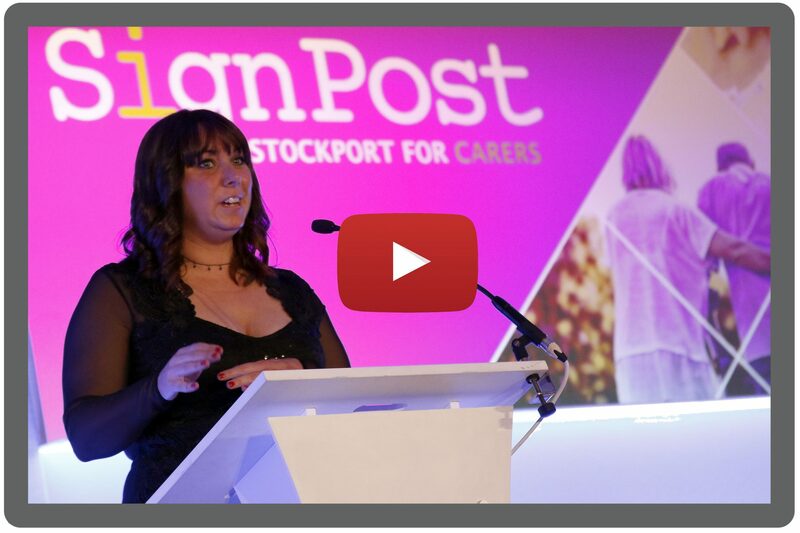 Julia Hewer, Deputy Director at Signpost Stockport for Carers adds “We were absolutely thrilled to be the charity partner of the 2018 Stockport Business Awards. The generous donations made on the night will enable more of our Borough’s unpaid carers to get a valuable break. The Awards have also given our charity an invaluable opportunity to connect with local businesses and we look forward to working with them over the coming months to support their customers and employees that also have a caring role”.